Literally everyone knows what a pilaf and almost anyone knows how to cook it. 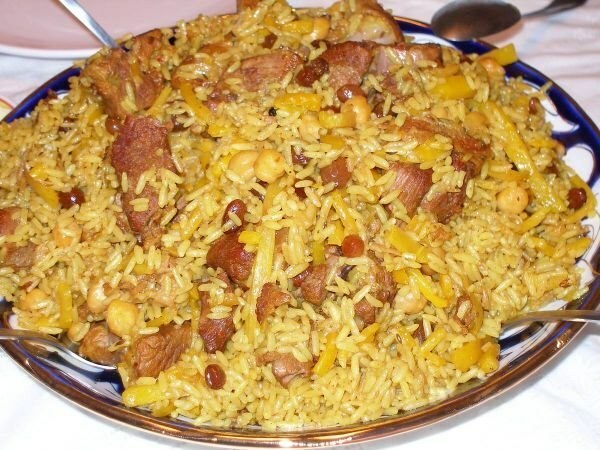 But not everyone knows the secret of how to cook pilaf, the rice was crumbly and at the same time melted in your mouth. First cut the meat into medium-sized cubes, fry them. Late to the meat add finely chopped onion and grated carrot. All these ingredients fry until Golden brown. Then cook the rice. Well wash it and fill it for 10 minutes with hot water. The rice should swell a little bit. Once the rice has swollen, put it on the stove cauldron and put it layers roasted meat with onion, carrots and well washed rice. In a large kettle add seasonings to taste, Bay leaf and squeezing a bit of garlic for flavor. The rice turned out crumbly, pour in a cauldron of hot water as much as was rice. The water should be boiling, and the ratio rice of 1:1. After placing all the ingredients in the cauldron, cover it with a lid and turn on high heat. To cook the pilaf should be exactly 12 minutes. This is the key to success friability of rice. Be sure to cook for 5 minutes on high heat, 4 in middle and 4 on the weak. Cover when cooking do not open the rice mix. After 12 minutes, turn off the stove and exactly the same do not remove the lid from the cauldron. It will give pilaf to stand, and the rice will not stick together. For cooking pilaf is better to choose parboiled rice. The round rice when cooking increased the stickiness and viscosity. For crumbly pilaf this rice is not suitable. From the rice to prepare the garnishes to the second dishes, crumbly and thick milk porridge, puddings, casseroles and pilaf. It is perfectly absorbed by the human body. It consists of starch, protein, vitamins, minerals and fiber. To a dish of rice turned out crumbly and delicious, it must be properly prepared for cooking. 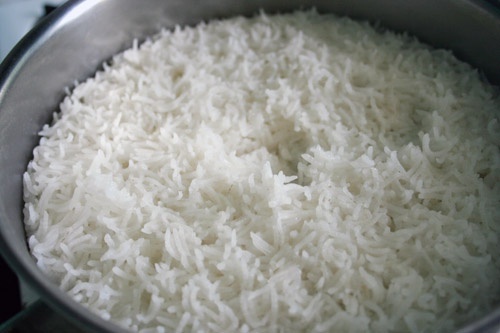 To clean round rice, first soak it in warm water for 15-20 minutes, and then rinse in cold water. To do this, pour the rice into a container, add cold, mix thoroughly, and drain the muddy water. Repeat procedure up until the water is clear. Long rice before washing do not need to soak. Just pour the rice into a container, add cold water and mix thoroughly, gently rubbing it between your hands and drain the muddy water. Repeat procedure up until the water is clear. After rinsing the rice dry on a paper towel. The water temperature for washing the rice should be at least 50 degrees. If the rice is soaked before cooking, it will be lighter and faster rassypchatyh is cooked, as will absorb a certain amount of water. For soaking, place the rice in a bowl and completely cover with cold water. Leave it on for 40 minutes and then drain in a colander and leave until then, until all water is drained. Now you can start making rice dishes. According to Asian traditions, rice must be sure to rinse well and soak in warm water with salt. Soaking time depends on the specific varieties of rice. If its characteristics are unknown, it is necessary to be guided by the color of the grains that should get a milky white color. The dispute about whether it is necessary to soak the rice intended for pilaf, not make sense, since it depends on the technology of cooking. No wonder the Turkish proverb says "there are so many kinds of pilaf, how many cities in the Muslim world". The main differences lie not only in the combination products siraka - roast in vegetable oil of onions, carrots, meat, fruits, vegetables, spices, but also in the preparation of cereal components. Because the rice sometimes it is connected with servicom in the cooking process, and in some cases extinguished separately. This dish appeared in the middle East with the culture of rice cultivation (II—III century BC), and then was picked up by the inhabitants of Central Asia, and if we take a sample of Central Asian pilaf, the rice is always soaked for him. The only question is, what is the rice to soak and for how long. As a result of cooking risotto, the rice must be quite crumbly, but not dry, not each variety of rice suitable for this dish. Each plouvara have to adapt to selling in the region of varieties because each of them requires its own approach. 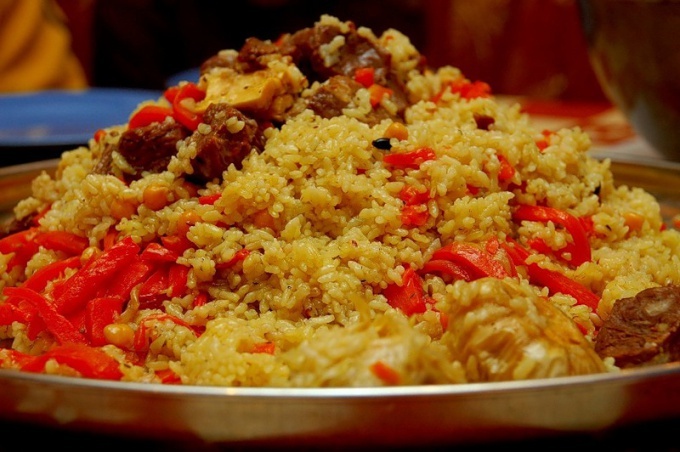 For example, the most popular Uzbek rice pilaf is famous virgins-Zira", which is grown in Ferghana, Andijan regions. Some versions of 'dev-cumin" can be found on the territory of Kyrgyzstan, Uzgen. Uzgen rice "Chungara" lighter and starchy, but has excellent water absorption. If subspecies have differences, they are minor. Grain is elongated, but not thin in circumference, color starchy powder after washing can vary from pink to brick. Even washed until transparent rice, not usually pure white, with some brown or red inclusions. The Russian lady is most often used in pilaf Krasnodar round grade or a long one "Basmati", imported from Pakistan and Afghanistan. Krasnodar rice is to cook a delicious risotto, only it is somewhat softer Uzbek varieties, and, therefore, steeping should be longer. "Basmati" can also differ in quality depending on the growing area. The content of the starchy substances in it may be almost zero, which does not benefit the taste of the pilaf. The principle of "the whiter and smoother the surface of the grains" is not appropriate for the array of Fig. On the contrary, it should have a roughness to better absorb water, fat, spices. High coefficient of videogamemaster is the main criterion of rice suitable for risotto. Even after spending several hours in the water, it will not stick to the rice and does not fall apart into small pieces. Before you soak the rice, it should be repeatedly rinsed under running cool water that is called "to clean water". This is done to wash off the excess powdery coating conducive when cooking viscosity. Even if at first glance the figure seems to be completely clean, should be washed 5-6 times prior to stage hours of soaking. "The virgins-Zira" requires a long soak from one hour to 10, the best is 3-4 hours. In addition, the water should be several inches above the surface of the rice, to prevent him to come into contact with air, which will lead to the excessive softening. Can be filled with water at room temperature or slightly warm with a pinch of salt, but not hot. If the variety of rice is not on the packaging reliable information and plov is cooked for the first time, it is necessary to observe the grain in the soaking process to determine its readiness. Indicator is a uniform milky-white colour grains. Not to be mistaken in the case of inexperience with time, can be limited to 1.5 - 2 hours. This time range is indicated by most Central Asian recipes for cooking pilaf. Soaking is necessary to ensure that in the process of cooking the grain reached the condition of almost at the same time. Already put soaked rice into the cauldron and Bay with water (if needed) 1-1. 5 cm above surface of rice, it is important not to simmer on a slow fire and boil for 7-10 minutes at a rapid boil without closing the lid. Only after that fire diminish to a minimum and the pilaf is cooked for 10 more minutes on a slow fire, and then disconnects. Kazan wrapped the top with a towel so as to cover the gap between the cover and utensils. So the rice comes to fitness for another 10-15 minutes. With this technology of cooking, the rice is in a crisp and scented of all the ingredients that are in service.